Where? It really doesn't matter where you install your LP unit as long as it's on the COLD mains pipe. This is because the LP puts a "current" in the water like a beam of light, which travels up-stream and down-stream to the remotest parts of the cold plumbing system. It is NOTHING to do with the direction of the water flow!. Also it doesn't matter whether the LP is lying on its side or upside down. A lot of people now use two-sided Velcro to attach the LP unit to a wall, as they really don't weigh very much (under 200gms). Don't worry about what the pipe is made of. LP works very well on all pipes including plastic, galvanised and copper. If your boiler is some distance from where your water enters the property you should fit a second LP unit on the cold pipe into the boiler. If you have a bigger property with say 5+ bedrooms you will need an LP2 on the cold pipe and you may also consider a dedicated LP1 on the cold feed to the boiler if the house has several bathrooms. LP units will only treat the water if there is no break in it. With a tank in the loft, the water fills up the tank through a ball valve so there is a break in the current. The water in the tank becomes untreated. 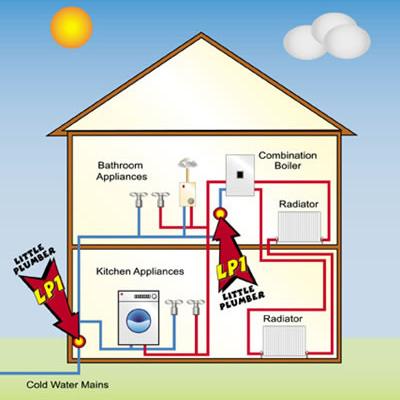 You will either need to install 2 x LP1's, one on your cold mains and one on the cold down service or if your cold mains pipe to the tank in the loft and the cold down service to your hot water cylinder run parallel together in your airing cupboard as they often do, you can fit an LP2 as in the diagram below. One aerial is wrapped around the cold mains and the other is wrapped around the cold down service. Don't forget that the LP2 has 4 times the output of the LP1. You will also find power in the airing cupboard too either as a fused spur or a plug. Have a look in your airing cupboard and if you have a 3-pin plug then installation of the LP2 is very easy. If not then you will need to ask an electrician or a plumber capable of electrical installation who holds a Part P certification. You will also find a smaller tank in the loft, which is the top-up tank for the central heating. The water in the central heating system is sealed and already treated with a chemical to stop scaling so needs no further treatment. 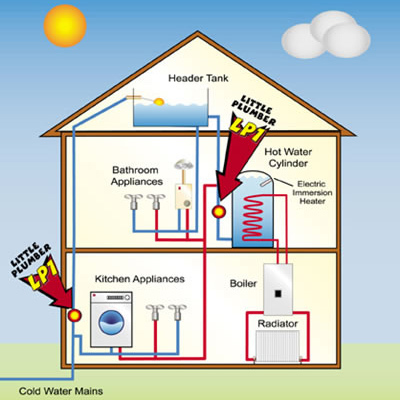 If you have a larger property with say 5+ bedrooms then you should install an LP2 on the cold mains and an LP1 on the cold down service to your hot water cylinder. The LP Solo (the only one in the world) is equivalent in output to an LP1. Larger properties with 10+ bedrooms will require an LP3 on the mains inlet and an LP2 on the cold down service. If you have a secondary return pipe to the boiler then another LP2 should be fitted to this.